It is the dry season in the Kimberley region of far northwestern Australia. 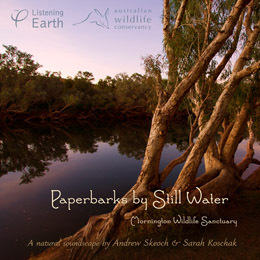 The waters of the Fitzroy River flow slowly, forming deep pools that reflecting the sky and the paperbark trees that line its banks. These paperbarks are known as cajeput in the local indigenous language, and have given their name to one of these still water pools. Dawn has come to Cajeput Waterhole, and the birdlife attracted to this place is in full voice. 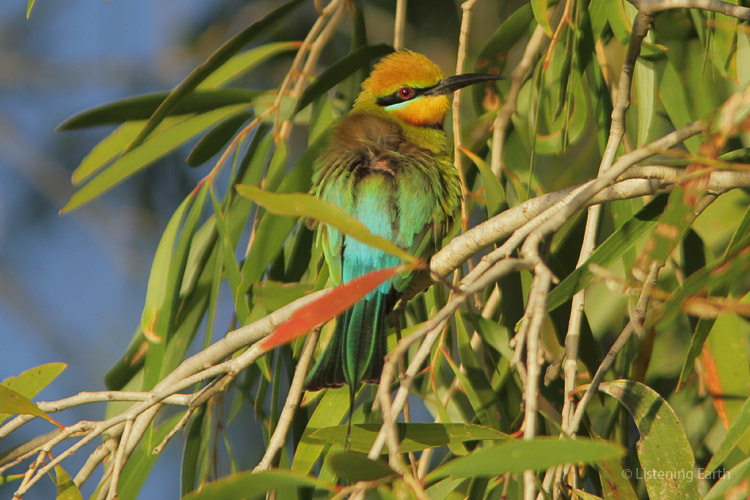 A rich variety of species can be heard; among them doves, friarbirds, flycatchers, whistlers, bee-eaters, butcherbirds, babblers, wagtails, finches, lorikeets, cuckoo-shrikes, and a variety of honeyeaters. Their voices come from the trees nearby and the opposite riverbank. Downstream, rapids can faintly be heard, but as the morning progresses and the air warms, these become less noticeable, and the birdsong becomes more spacious. Every now and then a faint splash signals the presence of fish in the nearby pool. This is a single un-edited recording, allowing you to sit and listen under the cajeput trees on the banks of the river, as birds sing all around in the morning sunlight. Cajeput Waterhole is a part of Mornington Wildlife Sanctuary, administered by the Australian Wildlife Conservancy. This recording has been made with their support, and documents why this region has such high conservation values. “When I arrive at a location, I set about looking for the optimal spot to place my microphones the next morning. Often I’m undecided, having identified more than one location. Nature can be unpredictable, and this leads to a quandary; with often limited time in the field, which place to choose? “So I now travel with two recording rigs whenever possible, doubling my chances of capturing a nice recording, and giving me some latitude if one spot turns out to be less productive than the other. It also allows me to take a risk on a location that might turn out to be interesting after all. “But every now and then, I find a spot so rich that both recordings are equally wonderful. Such was the case at Cajeput Waterhole, where the diversity of birdlife and birdsong was exhilarating. At first, I thought one recording was the highlight, but on further listening to the other, it is equally enjoyable.